If you want a scrumptious meal for this Valentine weekend that's delicious and healthy, I heartily ♥ suggest these salmon cakes. You can make them as an entree with a salad or make them into smaller patties to serve as an appetizer. I made them recently when the weather was cold and awful and I needed to prepare dinner with what was on hand. 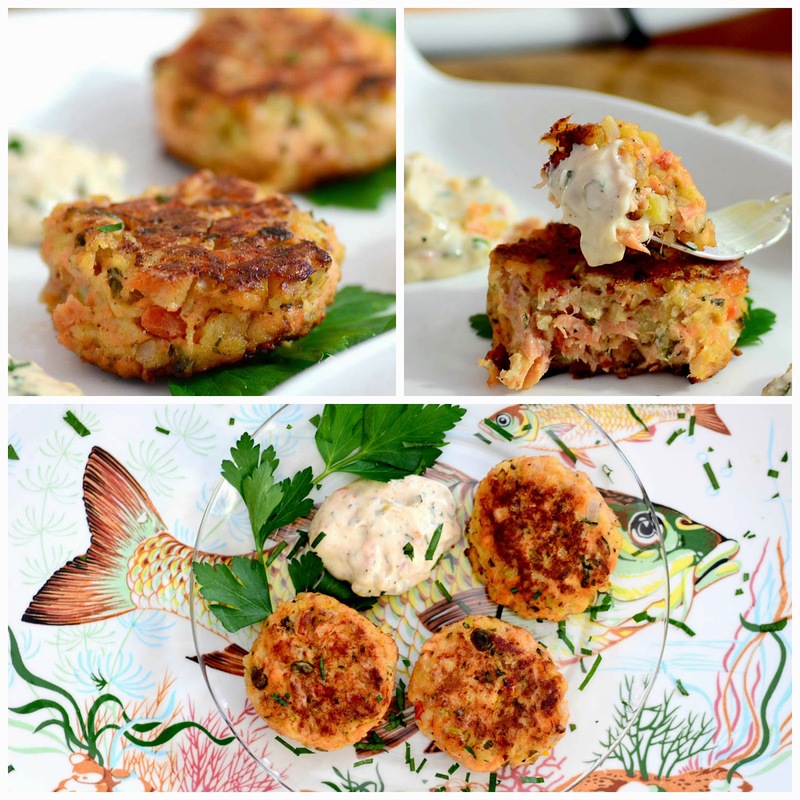 I had a beautiful piece of wild sockeye salmon in the freezer and everything else in the pantry and refrigerator to prepare these delicious salmon cakes. I had never made salmon cakes before! We love crab cakes and found a recipe for salmon cakes from Ina Garten that had many of the same delicious ingredients as my favorite crab cake recipe so I was hopeful they would be wonderful and they were! I served them with a homemade tartar sauce recipe from Cathy at Wives with Knives. It is the only tartar sauce I use because it is so good. The wonderful thing about this recipe is you can prepare everything in the morning and do the sauteing just before dinner. I served them with a salad. If you're looking for a special dessert to serve your sweetheart, look no further than my sidebar. PS: I'll be taking a short break ~ see you all in a week or two! Happy Valentine's Day! Place the salmon on an oiled sheet pan, skin side down. Tuck several Bay Leaves under the salmon. Brush with olive oil and sprinkle with salt and pepper. Roast for 15 to 20 minutes, until just cooked. Remove from the oven and cover tightly with aluminum foil. Allow to rest for 10 minutes and refrigerate until cold. Meanwhile, place 2 tablespoons of the butter, 2 tablespoons olive oil, the onion, celery, red and yellow bell peppers, parsley, capers, hot sauce, Worcestershire sauce, crab boil seasoning, 1/2 teaspoon salt, and 1/2 teaspoon pepper in a large saute pan over medium-low heat and cook until the vegetables are soft, approximately 15 to 20 minutes. Cool to room temperature. Break the bread slices in pieces and process the bread in a food processor fitted with a steel blade. You should have about 1 cup of bread crumbs. Place the bread crumbs on a sheet pan and toast in the oven for 5 minutes until lightly browned, tossing occasionally. Flake the chilled salmon into a large bowl. Add the bread crumbs, mayonnaise, mustard, and eggs. Add the vegetable mixture and mix well. Cover and chill in the refrigerator for 30 minutes. Shape into 10 (2 1/2 to 3-ounce) cakes. Heat the remaining 2 tablespoons butter and 2 tablespoons olive oil in a large saute pan over medium heat. In batches, add the salmon cakes and fry for 3 to 4 minutes on each side, until browned. Drain on paper towels; keep them warm in a preheated 250 degree F oven and serve hot. Combine all ingredients and refrigerate for several hours before serving. I highly recommend Cathy's Tartar Sauce! what lovely cakes Susan, I love salmon and look delicious! These do sound like a wonderful treat! We actually have some King Salmon in the freezer! I will give Cathy's Tartar Sauce a try too! I can attest to how good these are having done Ina's recipe. I needed this reminder though. Your plate and plating is beautiful. I hope your time off is good--and warm. When the weather is nasty and cold it is a good time to eat down the pantry/frig. Looks like you know how to pull it together to make it happen. This looks really good! yum....salmon is one of my favorites! I make these with crab and even albacore tuna...so good. Now I need to try the salmon cakes! I can't wait to try this- with Cathy's tartar sauce. It has to be an improvement over the salmon cakes I made in the 70/ using canned salmon! I love fish cakes, esp. if they are made with my favourite salmon!! They look mouthwatering, Susan. I haven't had salmon pattys/cakes in years but always loved them. This recipe sounds wonderful and so nice instead of a burger. Great recipe. By the way for your past 2-3 posts I've been unable to comment. It kept coming up that there was suspicious activity going on with your site so I wouldn't be able to get onto it. So glad that got resolved. Susan, we make salmon cakes often. And while I have salmon, I'm thankful that it is in the freezer, or else, I'd be staying up all night trying to thaw it, in order to replicate your dish. Happy Valentine's Day, Dear Heart. I hope you're going somewhere sunny and warm! We like salmon a lot and are lucky to live in a place where it is easily found. I've never made salmon cakes - really! Must give them a try. while i am not that fond of salmon, I'd go for these cakes in a heartbeat! great presentation too, a perfect way to cheer up a dreary winter day! have fun on your break ! Your salmon cakes are so beautiful and I love all of the crunch of the celery and bell peppers. How wonderful that they can be made in advance too and finished at the last minute. What a pretty fish peaking out from behind your plate. Happy Valentine's Day. I haven't made them in years. We used to get a big chunk of salmon on weekends and always had leftovers so sunday night would be salmon cake night. How I miss them. You have a perfect recipe there. I must try it. Thanks for reminding me how great they are! 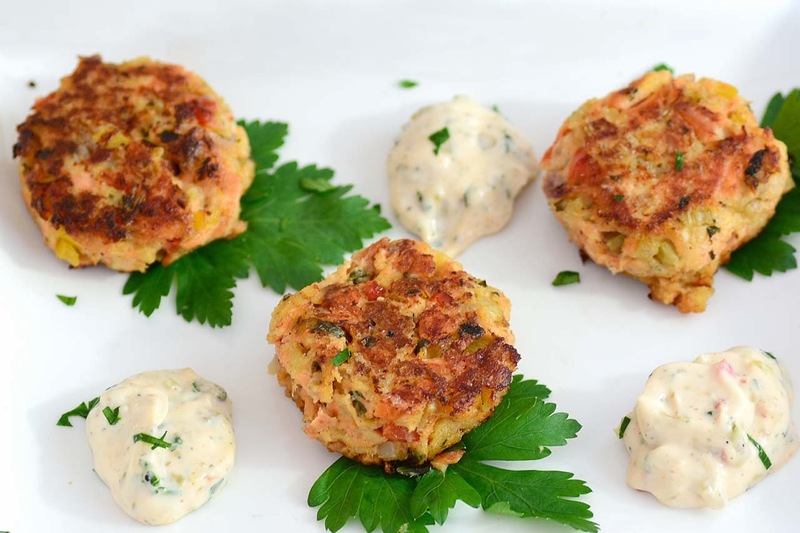 Those salmon cakes would even make a non-salmon lover want to try them! Lucky for me that I love it...and will try your recipe. Have a great weekend, Susan. I have bookmarked this recipe and am salivating after reading it. Salmon cakes are not usually my thing, but I can tell I would love these. Your presentations are beautiful..and totally tempting and appetizing..
Hav eto Pin..it's Valentine's day after all..Things you know you will love..
Oh lala that poisson plate:) or placemat? 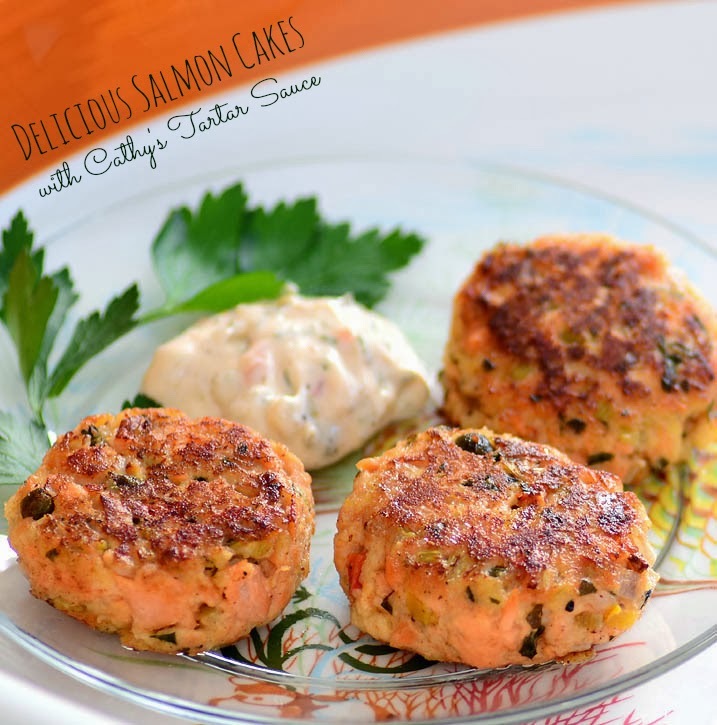 This has become our go-to salmon cake recipe and I think we may have used Cathy's tarter sauce, so I can concur that they are delicious and your presentation is very nice as well. Beautiful salmon patties Susan! I love this fish and this is such a great idea to serve it especially for a Valentine's meal. I hope you had a wonderful loving day! Susan I am so excited about trying this recipe. I have been thinking about making salmon cakes for sometime and now seeing this post I'm ready to. I love salmon cakes! These look beautiful! I hope the break is enjoyable and somewhere warm!!! Thank you so much for sharing your recipe for salmon cakes, Susan! I am deathly allergic to shellfish since my pregnancy with my son in the 1980's did a 'whack' on my immune system! Since then, I've never been able to nibble on one crab cake amidst other's enjoyment! So this is like a (literally) life-saving fish cake recipe for me! I'm pinning and printing AND praying that someday you'll tutor me on your superb, clear, stunning, perfect photography! And I'm serious . . . I'd pay ya! Wow, these salmon cakes looks utterly delicious! Wish I could bite into one right now! Those plump salmon cakes are just making me so hungry, although I finished my lunch just now. That homemade tartar sauce would be perfect with this. Your salmon cakes sound delicious! Love capers and the tabasco in these. Hi Susan - These salmon cakes look delicious and I'm looking forward to trying them. I made your crab cakes for my son's birthday dinner on Sunday and they were the best I've ever made...a huge hit. Happy to know that you enjoy the tartar sauce recipe. Many thanks for the link. I was just thinking I wish I had a good recipe for what my mom called, "Salmon Patties." These are just what I was looking for! Thanks so much for your beautiful post with the fun fish motif. I meant to come back and tell you I made your Salmon Cakes and they are fabulous! Easy and flavorful and very healthy. Will definitely make these again Susan. Thanks again. These look so beautiful and especially on that fabulous plate! The tartar sauce (always my favorite part) looks wonderful too. Your salmon cakes sound wonderful. So many recipes call for canned salmon which I don't care for. All of Ina's recipes are good! Your salmon cakes look delicious, Susan, I used to make these for my children when they were young as they liked the texture and flavor better than eating plain fish. I will have to try your recipe and see if my grandsons will like them! I have just sent you a message to your e-mail regarding our project. We MyTaste.com, one of the biggest recipe search engine in United States and in the world, would like to invite your blog to be featured on our site and make your recipes available to many people. If you like it, you can join through this link www.mytaste.com/add-your-food-blog. I'm glad to see your blog is back up!! These salmon cakes look absolutely delightful! Bandwidth has requested your salmon cakes. They look scrumptious!